We'd be happy to give you a tour of the ClearGov platform at your convenience. ClearGov provides a full suite of solutions to help local officials drive transparency, streamline budgeting, and better engage residents. NOTE: Product demos are reserved for government officials only. Budget season can be a stressful time of the year. The last thing you need to deal with is spreadsheet version issues, tracking down associated documents and complicated ERP/Accounting processes. 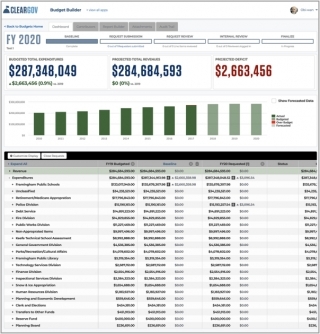 ClearGov Budgets not only streamlines your budget creation process, but also provides valuable trend analysis, collaboration tools, audit trails and much more. With recent passage of the OPEN Government Data Act, financial transparency is no longer aspirational, it’s law. Yet, the average resident (and even many internal stakeholders) are not adept at deciphering financial statements. 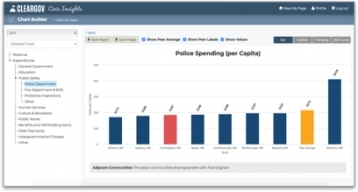 ClearGov helps you translate complex fiscal data into visually appealing infographics that everyone can understand. Clarity not only breeds trust, it helps you build consensus and drive productive citizen engagement. You push hard to fund capital projects, infrastructure improvements, and other initiatives. ClearGov makes it easy to get the word out fast. 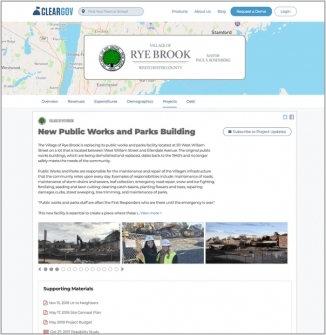 With ClearGov Project Communications you can share any details you want — from preliminary plans to timelines to ribbon-cutting pix. Best of all, anyone in your organization can post a page in minutes — no webmaster or design skills necessary. Plus, visitors to the page can subscribe to receive automatic updates! 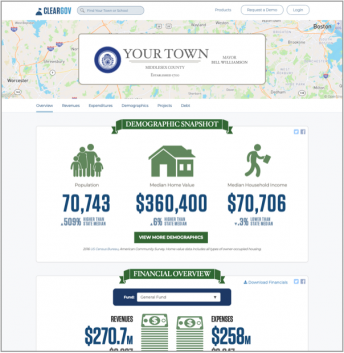 The ability to compare your tax spend to similar communities can be revealing and insightful. It can also be difficult, time-consuming, and prohibitively expensive. Not so with ClearGov. We’ve already done the legwork for you, compiling available financial data for every community in the country so you always have benchmarking intelligence at your fingertips. "ClearGov helped make our budget presentations more effective by consolidating dense financial information into clear, concise concepts that everyone could understand."